truthjihad.com blog: Got Cognitive Diversity? Take the Barrett-Sunstein "Crippled Epistemology Quiz" ! Got Cognitive Diversity? Take the Barrett-Sunstein "Crippled Epistemology Quiz" ! How Crippled is YOUR Epistemology? 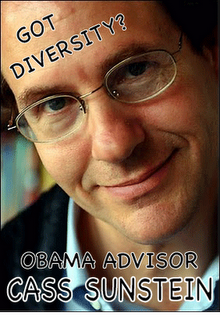 In 2008 Harvard professor Cass Sunstein "co-wrote a truly pernicious paper proposing that the U.S. Government employ teams of covert agents and pseudo-'independent' advocates to 'cognitively infiltrate' online groups and websites -- as well as other activist groups -- which advocate views that Sunstein deems 'false conspiracy theories' about the Government" (Greenwald). Sunstein's main target: 9/11 "conspiracy theories." Sunstein, who has not responded to my request for an interview, argues that by undermining 9/11 truth groups through cointelpro-style infiltration, or even banning "conspiracy theories" altogether, the government would be doing the "conspiracy theorists" a favor, by helping heal their "crippled epistemology" by providing them with much-needed "cognitive diversity." Wait a minute, Cass...just what do you mean by "crippled epistemology" ? Take NIST's WTC-7 report...please. Now THAT is crippled epistemology! Setting out to explain the "collapse" of WTC-7 while refusing to consider the most likely hypothesis -- controlled demolition -- is like cutting off both legs before learning to walk. So "crippled epistemology" means believing just about any damned thing, no matter how ridiculous, as long as it fits your preconceived worldview (or the demands of your paymasters)...and rejecting any new information, no matter how well-supported, if it doesn't. Another word for this is "confirmation bias." Let's face it--all of us suffer to some degree from confirmation bias. And those of us in the 9/11 truth community, having learned just how deep the rabbit hole goes, sometimes have a hard time distinguishing satire from reality. To find out whether YOUR epistemology is crippled or healthy, take the Barrett-Sunstein Crippled Epistemology Quiz! 1. Which of the following articles about Iranian President Mahmoud Ahmadinejad is an actual news report, and which one is satire? 2. Which of the following articles is an actual news report about Sen. Joe Lieberman, and which one is satire? 3. Which of the following two articles on Goldman-Sachs shorting the Gulf of Mexico was intended as satire and which one was serious? 4. After reading them both, do you think Goldman-Sachs shorted the Gulf of Mexico? A) Definitely - I'd bet the farm on it. B) Quite possibly - I wouldn't put anything past them, and there seems to be some evidence for it. C) I doubt it, but who knows? D) Of course not! That's just a crazy conspiracy theory! Feel free to submit your answers as comments on this blog, or by emailing me at kbarrett(AT]merr.com.